Walt’s People: Volume 17 features appearances by Lorina Coomber Butler, Leigh Harline, Jim MacDonald, Woolie Reitherman, T. Hee, Jack Hannah, Frank Thomas and Ollie Johnston, Ken Anderson, Dan Doonan, Jack Bruner, Art Stevens, Bill Anderson, Bob McCrea, General Joe Potter, Harper Goff, and Phil Mendez, plus a short autobiography by Bill Wright and an article by Mary Lou Whitman about her job as a color supervisor at the Disney Studio in the late 1930s. 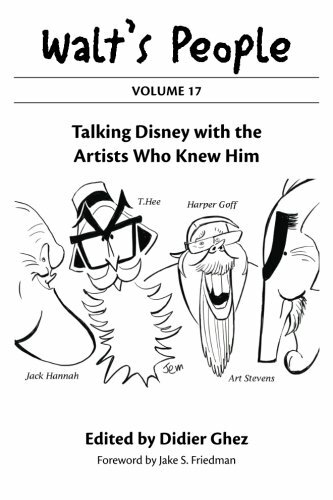 FRANK THOMAS AND OLLIE JOHNSTON chat about their long careers at the Disney Studio as two of Walt Disney’s “Nine Old Men”, their lifelong friendship, and the politics and philosophies of animation. BILL ANDERSON shoots from the hip with his candid comments about Walt and Roy Disney, Disney artists and animators, and how close the studio came to disbanding Feature Animation after Walt's death. GENERAL JOE POTTER shares war stories about the many challenges he overcame during the construction of Walt Disney World. HARPER GOFF reflects upon his relationship with Walt, his years as an Imagineer with WED, and his work on such films as 20,000 Leagues Under the Sea, in a unique book-length narrative.